Hand picking the best range of accommodation from small and inexpensive self catering villas to some of the world’s best hotels including Sir Richard Branson’s five star Necker Island resort BVI Holidays offers a range of dream trips to suit all budgets. As well as detailing all the accommodation by Island the site also offers yacht charter as well as a big range of activities including spa treatments, diving and watersports. 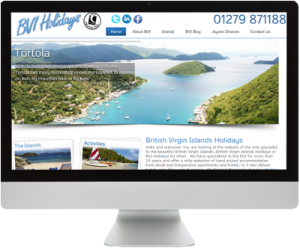 Why not let the BVI Holidays team help plan your wedding in five star luxury? We built a content management website that allows the team to modify and add to all parts of the site with ease as well as keep a regularly updated blog so that the latest news and events are always current. The website has also been made mobile friendly so when you visit the site on a mobile device the site will respond to the correct screen size.